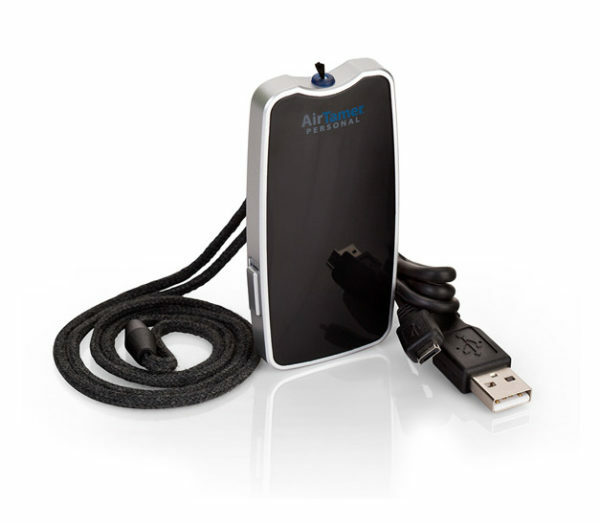 The AirTamer A310 is the world’s most effective personal rechargeable air purifier. 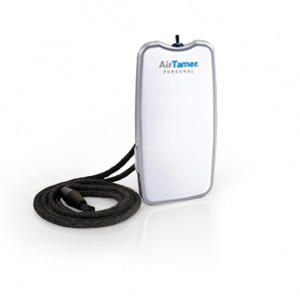 AirTamer’s Advanced Ionic Technology emits a constant stream of healthy negative ions that force airborne pollutants away from your personal space giving you a zone of cleaner, healthier air. 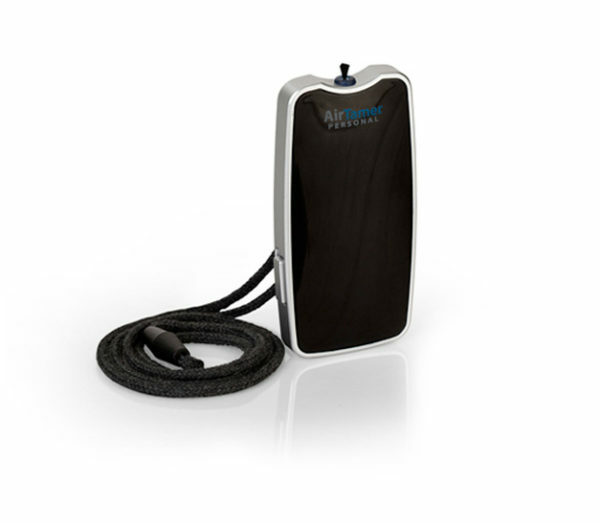 AirTamer’s state-of-the-art electrostatic purification creates a 3 foot sphere of cleaner, healthier air around your head. It cleans the air of atomic sized pollutants (e.g. viruses, pollen, smoke, molds and dust mites) that traditional air purifiers (e.g. HEPA) leave behind. 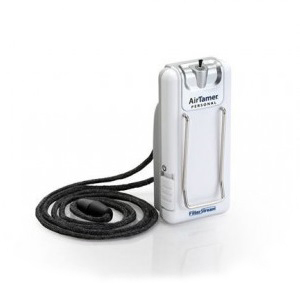 AirTamer’s Power Boost Technology provides 9 times more cleaning power than the competition. 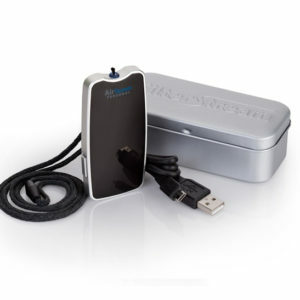 It is silent in operation and it’s extremely energy efficient technology provides 150+ hours of run time on one charge. Easily charged by included USB cable. 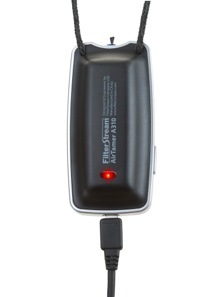 AirTamer’s design is ultra compact and incredibly versatile. A proprietary conductive adjustable lanyard dramatically improves performance and increases run time. 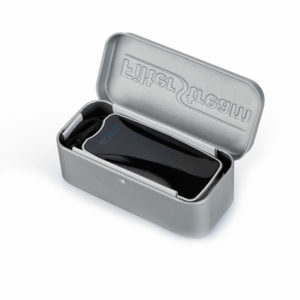 You can wear it around your neck (strap included) since it is smaller than most MP3 players or place it freely on your nightstand so the air around your pillow is clean and free of pollutants. 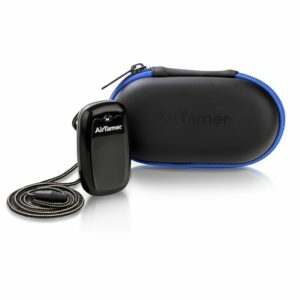 Wear AirTamer to create a cleaner zone of healthier air while traveling, in public places or in other poor air quality locations. 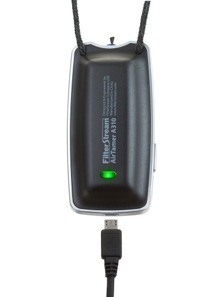 The green “on” indicator light gently blinks to indicate AirTamer® is cleaning the air. Power Boost Technology for 9 times more cleaning power. 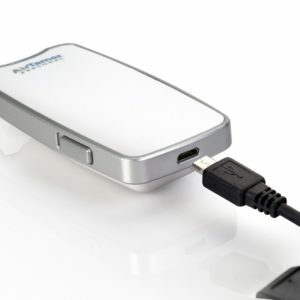 Rechargeable - 150+ hours of run time on one charge. USB charging cable is included with each unit. Product dimension : 1.65" x 0.75" x 3.5"
Package dimensions : 4.4" x 1.4" x 2"
Q: How does the AirTamer® work? 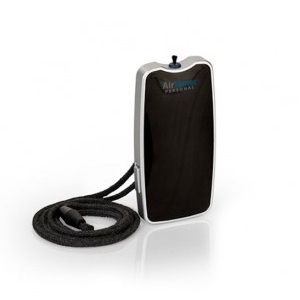 A: AirTamer® emits negative ions from the little black brush that you see at the top of the unit. Over 2 million negative ions are emitted from that brush every second. These negative ions attach themselves to air particles like allergens, viruses, etc. in the air and negatively charge those particles. Those negatively charged particles will then be naturally attracted to positively charged surfaces around you (e.g. a table, chair, window, clothes, etc. ), rather than continuing their way towards your breathing passage where they can make you sick. Result: AirTamer reduces the probability that you will inhale these bad particles and become ill.
Q: How can I tell if my AirTamer® is working? 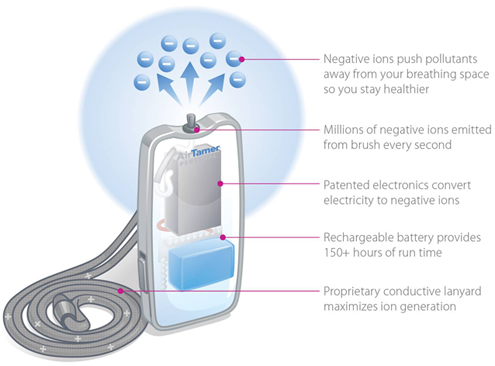 A: AirTamer emits healthy negative ions from the ion emitter brush (i.e. the black brush located on top of the unit). If you put the ion emitter brush close to your lips your will be able to feel the ions tickle your lips. This is because the AirTamer® emits over 2 million negative ions per cubic centimeter every second – this is the highest cleaning power of any personal air purifier in the world – by a factor of 9! Additionally, there is a tiny green LED on the back of the unit that flashes when AirTamer® is emitting ions. 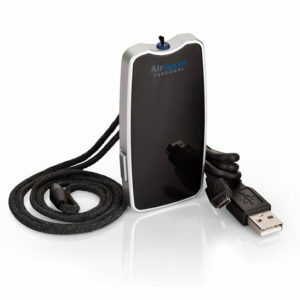 Q: Can AirTamer® purify cigarette smoke from the air? A: Yes. We actually test the AirTamer with smoke in test labs since smoke particles are so small and represent a great test particle. 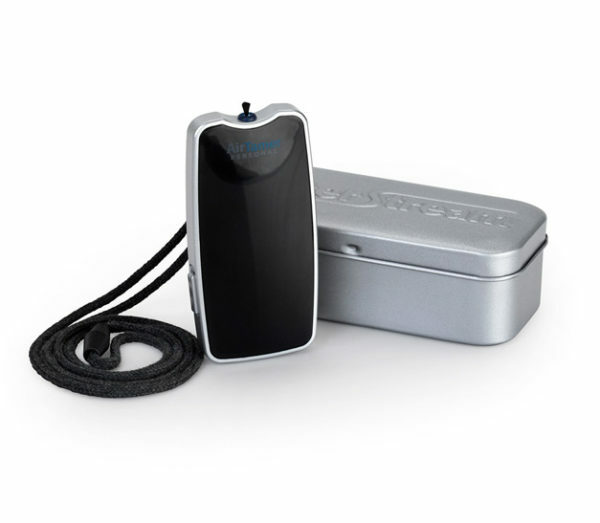 The AirTamer® is very effective at reducing smoke from a person's breathing space. However, the AirTamer IS NOT a room air purifier – it is meant to clean the air around your head – about a 3 foot sphere is a good benchmark. The further your face is away from the AirTamer®, the fewer ions will reach your breathing space, so we recommend hanging it from your neck and using the adjustable lanyard to adjust the length so the AirTamer® is positioned in the upper part of your chest. 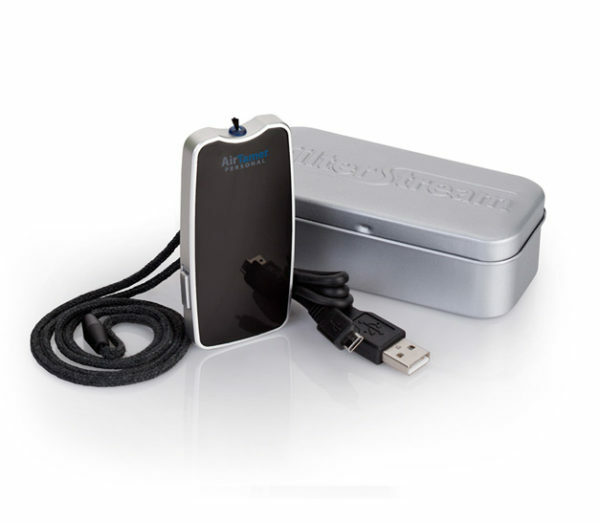 Q: How long will the AirTamer® last with fully charged batteries? A: 150+ hours of use on one charge. 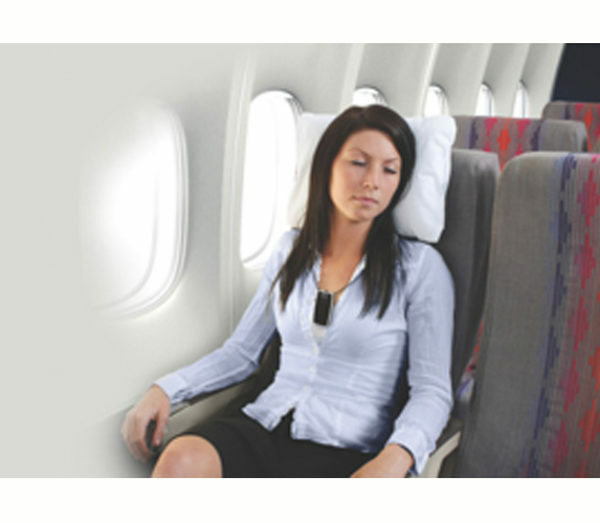 Q: Can you use the AirTamer A310 on airplanes? A: The Transportation Security Administration (TSA) and FAA do not prohibit the use of personal air purifiers on board airplanes. Click here to view 'Prohibited Items List'. 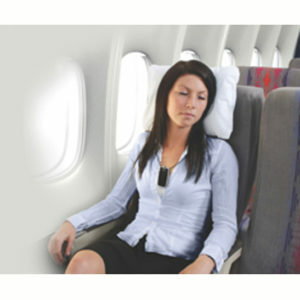 We are FCC certified not to interfere with airplane electronics, but some airlines do restrict their use. It all stems from a fire that was caused by our competitor – Wein – several years ago. Wein sold a battery charger for their large 123A rechargeable battery and a customer charged a disposable 123A battery thinking it was a rechargeable battery. When the Wein unit was turned on, the battery created heat and smoke, so the plane landed. This rare situation cannot happen with the AirTamer® because the A310 battery is not big enough to produce similar amounts of heat energy. Q: Does the AirTamer®make noise? A: No. AirTamer® is silent. Q. What kinds of batteries are allowed in carry-on baggage (in the aircraft cabin)? A. Passengers can carry most consumer batteries and personal battery-powered devices. Spare batteries must be protected from damage and short circuit. 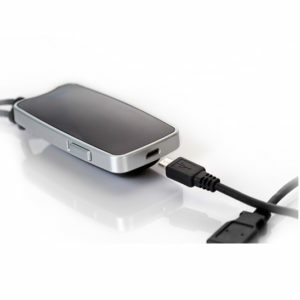 Battery-powered devices should be protected from accidental activation. Dry cell alkaline batteries typical AA, AAA, C, D, 9-volt, button sized cells, etc. 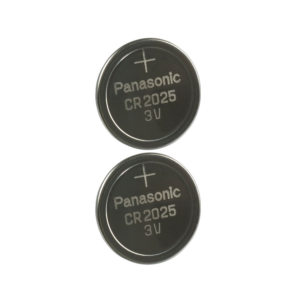 Dry cell rechargeable batteries such as Nickel Metal Hydride (NiMH) and Nickel Cadmium (NiCad). For rechargeable lithium ion batteries; see next bullet point. Lithium ion batteries (a.k.a. 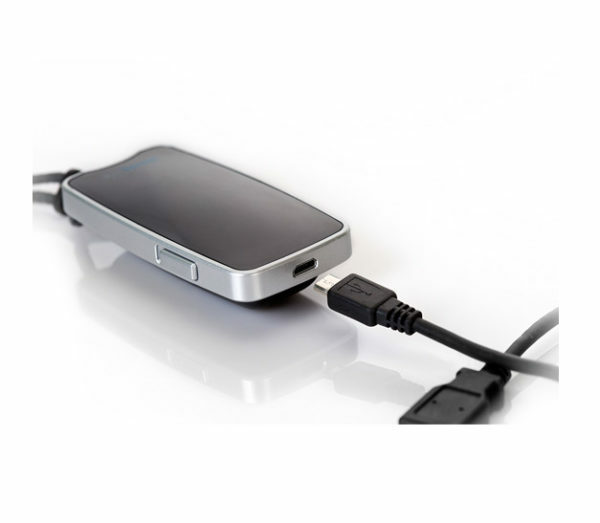 : rechargeable lithium, lithium polymer, LIPO, secondary lithium). 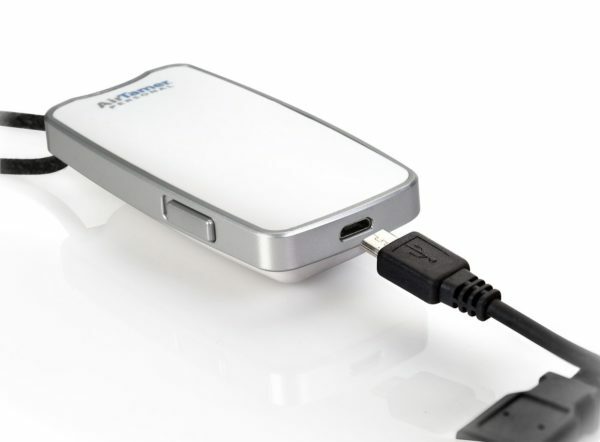 Passengers may carry consumer-sized lithium ion batteries [no more than 8 grams of equivalent lithium content or 100 watt hours (wh) per battery].This size covers AA, AAA, 9-volt, cell phone, PDA, camera, camcorder, Gameboy, and standard laptop computer batteries.Passengers can also bring two (2) larger lithium ion batteries (more than 8 grams, up to 25 grams of equivalent lithium content per battery) in their carry-on. This size covers larger extended-life laptop batteries. Most consumer lithium ion batteries are below this size. Lithium metal batteries (a.k.a. : non-rechargeable lithium, primary lithium). These batteries are often used with cameras and other small personal electronics.Consumer-sized batteries (up to 2 grams of lithium per battery) may be carried. This includes all the typical non-rechargeable batteries for personal film cameras and digital cameras (AA, AAA, 123, CR123A, CR1, CR2, CRV3, CR22, 2CR5, etc.) 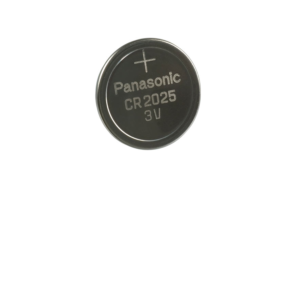 as well as the flat round lithium button cells. Q. What kinds of batteries are allowed in checked baggage? A. Except for spare (uninstalled) lithium batteries, all the batteries allowed in carry-on baggage are also allowed in checked baggage. 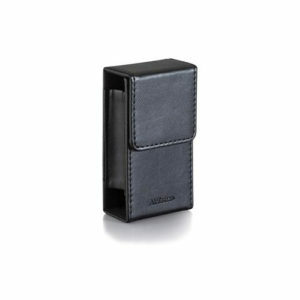 The batteries must be protected from damage and short circuit or installed in a device. Battery-powered devices – particularly those with moving parts or those that could heat up – should be protected from accidental activation. Spare lithium batteries (both lithium metal and lithium ion/polymer) are prohibited in checked baggage. Q. Is there a limit to the number of batteries I can carry? A. There is no limit to the number of consumer-size batteries or battery-powered devices that a passenger can carry. Only the larger lithium ion batteries are limited to two (2) batteries per passenger; see “Lithium ion batteries” explanation above. Q. What does “protected from short circuit” mean? A. Protected from short circuit means that a battery’s terminals are protected from being touched by metal. When metal such as keys, coins, or other batteries come in contact with both terminals of a battery, it can create a "circuit"or path for electricity to flow through. This can cause extreme heat and sparks and even start a fire. To prevent short circuits, keep spare batteries in their original packaging, a battery case, or separate pouch or pocket. Make sure loose batteries can't move around. Placing tape over the terminals of unpackaged batteries also helps to insulate them from short circuit. AirTamer is laboratory tested to be the best. Smoke is a good test pollutant because it is one of the smallest particles in air and it is very common around the world. 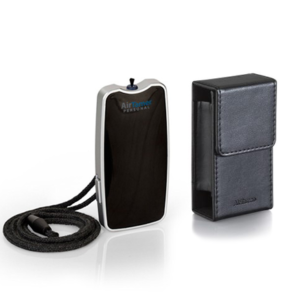 The videos below show how effectively the AirTamer 310 High Performance Personal Rechargeable Air Purifier cleans the air of smoke. In independent tests undertaken by the prestigious Intertek test laboratory, AirTamer reduced smoke particles by 98.9% in just 5 minutes. 875% better than our closest competitor! Studies show the risk of catching a cold while flying is as high as 20%. 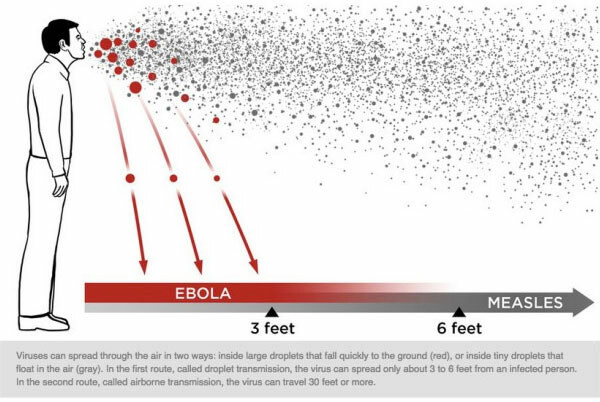 How far can viruses travel? Whenever I did not wear my AirTamer, I had bad asthma attacks. 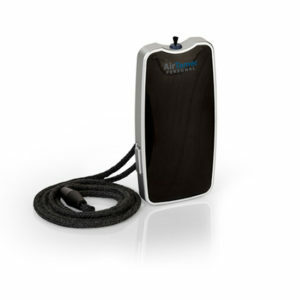 When I put AirTamer on, I was breathing better within 20 minutes. I love my AirTamer! I have used AirTamer for a number of years. Everytime I have ever flown and I didn’t use AirTamer I ended up with a respiratory infection. Thank you for a wonderful product. Can't tell if it truly works. But I have not caught a cold. And I do a lot of flying. 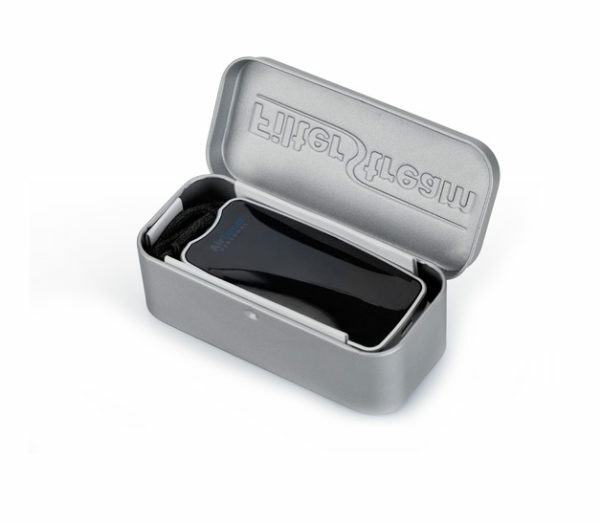 Handy travel buddy for those who catch colds on airplanes or are exposed to smoke.